MSRP $299,010. 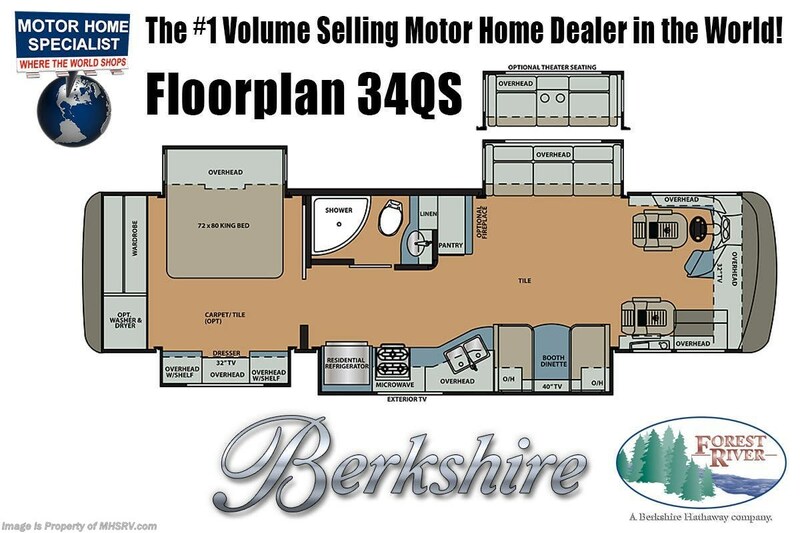 New 2019 Forest River Berkshire RV model 34QS for sale at Motor Home Specialist; the #1 Volume Selling Motor Home Dealership in the World. This luxury RV measures approximately 35 feet 7 inches in length and features 4 slides, a 360HP Cummins diesel engine, Aluminum Wheels, Onan diesel generator on a slide, Raised Rail Freightliner chassis, Front disc brakes, Neway air suspension and Sachs custom tuned shock absorbers. Optional equipment includes the beautiful full body Sikkens paint exterior with 4-X Clear Coat, front overhead loft, stackable washer/dryer, electric fireplace, front overhead TV and Winegard HD Traveler satellite system. The Forest River Berkshire features one the most impressive lists of standard equipment you'll find in the industry including a crowned and layered vacuum bonded fiberglass roof, multiplex lighting, one piece windshield, leatherette driver seat swivel with 6-way power adjust, multiple auxiliary charging ports at dash, hardwood cabinetry and slide-out fascia, full extension ball bearing metal drawer guides, 10" dash radio with navigation and integrated camera monitor, exterior entertainment center and much more. For more complete details on this unit and our entire inventory including brochures, window sticker, videos, photos, reviews & testimonials as well as additional information about Motor Home Specialist and our manufacturers please visit us at or call 800-335-6054. At Motor Home Specialist, we DO NOT charge any prep or orientation fees like you will find at other dealerships. All sale prices include a 200-point inspection, interior & exterior wash, detail service and a fully automated high-pressure rain booth test and coach wash that is a standout service unlike that of any other in the industry. You will also receive a thorough coach orientation with an MHSRV technician, an RV Starter's kit, a night stay in our delivery park featuring landscaped and covered pads with full hook-ups and much more! Read Thousands upon Thousands of 5-Star Reviews at and See What They Had to Say About Their Experience at Motor Home Specialist. WHY PAY MORE?... WHY SETTLE FOR LESS? Check out Stock # FFR021995627 - 2019 Forest River Berkshire 34QS on forestriverrvsource.com!